On the 24th (Sat), identify plant and animal life at Kopara Reindeer Park and then admire all the interesting features of Amethyst Mine Lapland. To find other places to visit, where to stay, and other tourist information, go to the Luosto itinerary planning website . Beirut, Lebanon to Luosto is an approximately 14.5-hour flight. Plan for much colder temperatures traveling from Beirut in November, with highs in Luosto at -3°C and lows at -9°C. Finish up your sightseeing early on the 24th (Sat) so you can go by car to Saariselka. Start off your visit on the 25th (Sun): gear up at Saariselka Ski & Sport Resort. On your second day here, explore the striking landscape of Urho Kekkonen National Park, then see the interesting displays at Gold Prospector Museum, then stop by Hippupuoti Gift Shop, and finally take in the architecture and atmosphere at Saariselka S:t Paulus Chapel. For maps and more tourist information, read our Saariselka itinerary planner . Getting from Luosto to Saariselka by car takes about 2.5 hours. Other options: take a bus. In November, daily temperatures in Saariselka can reach -3°C, while at night they dip to -10°C. Finish your sightseeing early on the 26th (Mon) so you can travel to Levi. Start off your visit on the 27th (Tue): get a dose of the wild on a nature and wildlife tour, don't miss a visit to LUVATTUMAA - Levi Ice Gallery, and then get your game on at Kid's Land. For photos, other places to visit, reviews, and tourist information, read our Levi online trip itinerary planner . 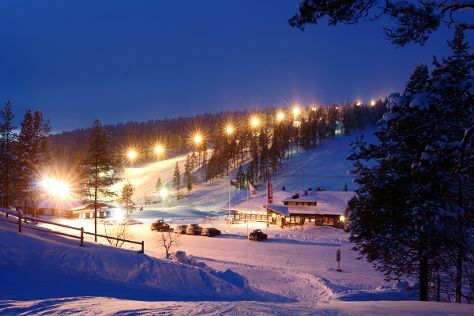 You can do a combination of bus and flight from Saariselka to Levi in 3 hours. Other options are to drive; or take a bus. Expect a daytime high around -3°C in November, and nighttime lows around -11°C. Wrap up your sightseeing on the 27th (Tue) to allow time to drive to Rovaniemi. Start off your visit on the 28th (Wed): enjoy some diversion at Snowman World Igloo Hotel, examine the collection at Christmas House Santa, take in the architecture and atmosphere at Rovaniemi Church, then snap pictures at Lumberjack's Candle Bridge, and finally make a trip to Lordi's Square. To find more things to do, traveler tips, photos, and more tourist information, go to the Rovaniemi journey planner. You can drive from Levi to Rovaniemi in 2.5 hours. Another option is to take a bus. In November in Rovaniemi, expect temperatures between -2°C during the day and -7°C at night. Wrap up your sightseeing by early afternoon on the 29th (Thu) to allow enough time to travel back home.